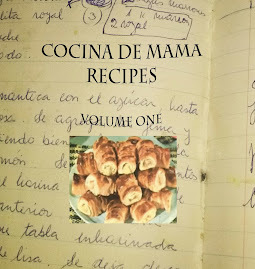 In the last blog we learnt the secret of dulce de leche. I saw it used throughout the years in various forms in many desserts and I'd like to share with you a few of my mums favourites that she cooked for us as Sunday afternoon treats. There was no better way to face the impending doom of Monday than to wash it away with a small treat which made us cherish the day we had at hand... and of course there was always one or two left over for the lunch boxes in our school bags on Monday - just to see us through the day - and make all our school chums a tad jealous! 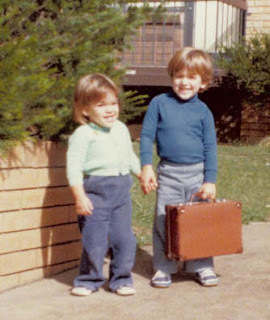 I'm sure, to this day, that is why my brother and I are smiling so insanely in this photo - we knew what was awaiting us in the school case! A lovely way to utilise the dulce de leche is on a cup cake. These little tea cakes are called Princesitas (little princesses). 1/4 kilo of dulce de leche (see previous blog to learn how to make this Argentinean caramel). Place the egg yolks and sugar into a bowl and beat until creamy. In a separate bowl whip the egg whites until they are fluffy and stiff. (Small tip: It is best to begin at a slow speed and gradually move up to high when beating egg whites. Also be sure to stop beating your egg whites when they get fluffy If you overbeat them, they will liquify again. Make sure you use beaten egg whites right away. Do not let them sit). With a wooden spoon, gently fold the egg whites into the previous mixture. Mix together the plain flour, corn flour and baking powder and add gently again to the previous mixture, stirring through (you only need to make sure it is all mixed in - so don't over stir the mixture). Place the mixture in cup cake tins which have been lined with butter and flour to prevent sticking. Place in oven for 15minutes. Once cooked let the cup cakes cool down and remove from the mould. With a circular cookie cutter remove the top of the cup cake gently. You don't want to cut down too deeply roughly 1 or 2 centimetres. Place the tops of the cup cakes to the side - be careful to keep them whole. Mix the port and the dulce de leche until creamy. Fill the cut out part of the cup cake with dulce de leche/port mixture (letting it overflow a little). Place the top of the cup cake back on top (like a princesses tiara!). To finish, gently sprinkle some icing sugar over the cup cake. Hey there, I have to confess to not yet rolling up my sleeves and getting cooking. But I'm addicted to checking out the site anyway just so I can see these adorable photos. Are you sure that's ALL your bro's got in the case??? PS - Can you buy quince jam just off the supermarket shelf? My boring old Coles doesn't have it. We are looking a little suss I the photos aren't we!